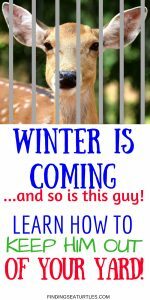 Keep Deer Out of Your Garden Because Winter is Coming! 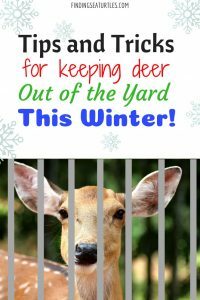 How to keep deer out of your garden and yard is frustrating to say the least. We live in a shared environment between nature and us. At times, I feel as if the deer are winning the ongoing struggle. We love all animals but we love our gardens too. Keeping our gardens and yards healthy and tidy can be challenging enough. The thriving local deer population loves to graze most plants in our garden. They browse on coneflowers, Limelights hydrangeas, rhododendrons, sky pencils, variegated and dark green Liriope. There is very little that they don’t munch on in our yard. The boxwood and Japanese hollies seem to be two shrubs that they don’t bother. While winter is around the corner, we are preparing for the influx of more deer. As colder weather arrives, green vegetation becomes scarce. There are less and less green plants for the deer to browse. 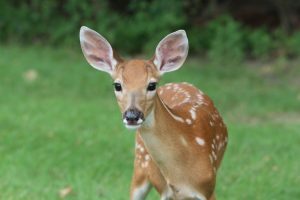 Which means plants that deer typically are not attracted to may suddenly be devoured overnight. Male deer eat between 4 to 10 pounds of plant material each day. Deer travel further in search of food as green vegetation becomes scarce throughout the Winter months. With cooler days and nights, you will notice torn leaves and ripped plant stalks or branches. This type of plant damage is caused by deer browsing. So, How do we Keep Deer Out of our Garden? At the beginning of our gardening journey, we researched which plants deer did not eat. We visited nurseries, talked to plantsmen, and searched the internet for the right plants. After we decided which plants we would have the best results with, we planted some deer resistant plants. We made every effort to only select deer resistant plants. 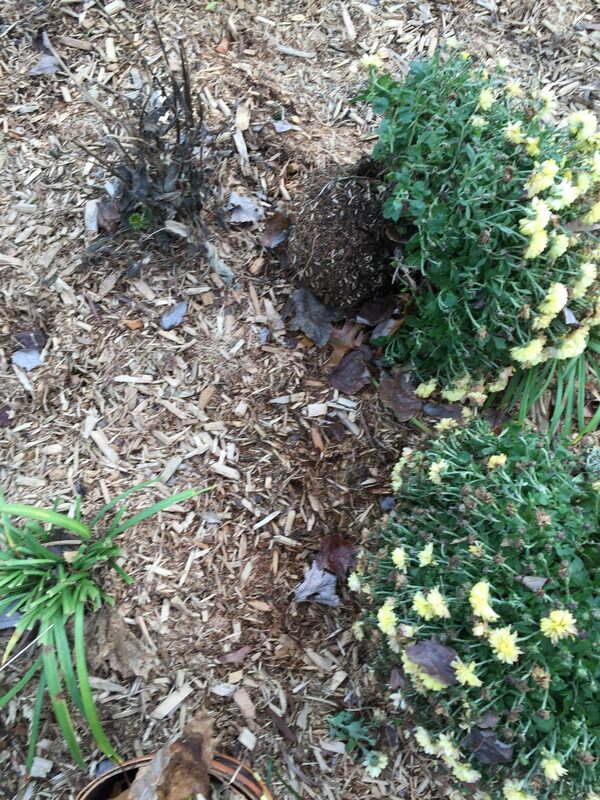 We also removed plants and shrubs that deer were attracted to. It was our hope that this might deter deer from disturbing any of our garden plants. We thought that the deer would roam through the yard and move onto the next yard. Hunger is a powerful motivator. Much to our disappointment, the deer continued to browse our garden. This included the “Deer Resistant” plants and shrubs. And I do recall what the grower’s plant label says. The grower’s plant labels clearly states that “Deer Resistant” does not mean “Deer Proof”. So, in the dead of Winter when nothing else is available, deer will eat “deer resistant” plants! It becomes a matter of survival. These are plants that are less desirable to deer. Plants such as chrysanthemums which usually remain untouched can be eaten by deer over the Winter months. This year we have noticed deer pull out our Fall Chrysanthemums from the ground. There were a few broken Mum pieces left on the ground. Most of the Mums was left laying on its side. Had we not noticed this, our Chrysanthemums would have been lost due to cold temperatures. On the left side of the photo above is Liriope that has been eaten as well. After losing many of our deer resistant plants to deer foraging, we decided to take this to the next level. 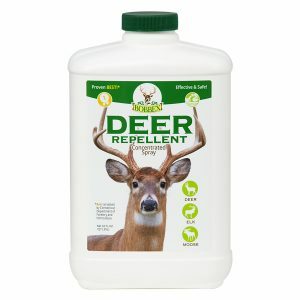 We purchased a deer repellent spray to save the few remaining plants from the deer. We sprayed Liquid Fence Deer & Rabbit Repellent around our plants and shrubs. The Liquid Fence Deer & Rabbit Repellent worked well. However, the spray seemed to be effective for a few days. And after any rainfall, the plants needed to be resprayed. During the Spring time, we receive quite a bit of rain. Respraying after every rainfall was too much to maintain. With our hectic schedule this method is ineffective. We needed a more reliable deer repellent product. A deer repellent product that would provide protection even after a heavy rainfall. The second product we tried was Deer Scram Repellent. Deer Scram comes in a granular form. The granular Deer Scram is in a white pail. Deer Scram is applied to the surrounding soil of the plant or shrub. We sprinkled the Deer Scram around the soil area. We found the Deer Scram to be not effective for our area. The deer simply stepped over the granular product. Then continued to feast on our garden plants. The next product we tried was Bobbex Deer Repellent Concentrated Spray. Bobbex is a topical foliar spray mix. After spraying both our shrubs and plants with Bobbex we noticed that most of our plants were undisturbed. Occasionally, we will notice a plant that is out of place or with a few broken stems. However, this happens infrequently. This is a dramatic improvement over the last previous attempts to discourage deer from browsing in our garden. Even our Hostas and Coral Bells have been untouched after being sprayed with Bobbex. Hydrangeas and rhododendrons do not seem to be affected as well. We mixed Bobbex with water in a spray container. During the Spring and Summer seasons, the recommended mixture is 1 part Bobbex to 8 parts water. The Bobbex mix should only be used on dry plants and shrubs. In the growing seasons, apply Bobbex every 7 to 14 days or if new foliage growth is 2 or more inches. Over the Summer months we applied Bobbex every other week. We had great results with the Bobbex method. For mixing the Bobbex Deer Resistant Concentrated Spray, we used the Chapin SureSpray Sprayer. 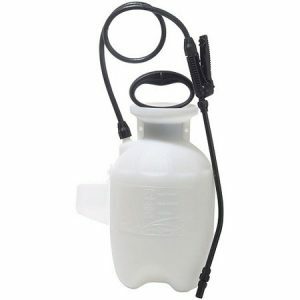 The black handle also serves as a pump. The curved black wand makes it easy to spray over and under plant foliage. Allowing us to completely coat the foliage and stems of the plant and shrubs. During the Fall and Winter seasons, the recommended mixture is 1 part Bobbex to 5 parts water. The Bobbex mixture was stronger and not diluted as much. This has been effective over the Winter months too. Plants treated with Bobbex during the Winter season can last up to 2 months. Apply on dry plants and shrubs. Sprayed plants and shrubs should remain dry for at least 6 hours. Spray plants liberally with the Bobbex mix. Coat Bobbex on and underneath the leaves, stems, buds, and flowers. So far Bobbex has been the most effective method to Keep Deer Out of our yard. We have had excellent results with Bobbex Deer Repellent Concentrated Spray. If Bobbex Deer Repellent was ineffective, the next step is to install a deer fence. For now we will continue using Bobbex Deer Repellent. It is a relief to know most of our plants will survive the influx of deer over the Winter. Of course, we hope that they survive the Winter cold too. We have heard of some homemade deer repellent remedies as well. One that we hear about more frequently about, is using a bar of Irish Spring soap. The Irish Spring bar soap is shaved. The shavings are spread in the surrounding garden beds. Another common method is to have young boys pee in the garden beds. Apparently, deer do not like the smell of pee! I’m not sure about this one. Another homemade deer repellent is to use a paprika seasoning, crushed garlic or an egg mixture. The mixtures are then sprayed in the garden beds and around the plants. The odor keeps deer out and my guess – is they keep people out too. If you have some tips that you’ve found to be effective to keep deer out, please share them with us. We would love to know what your “go to” method is! We’ve heard of some homemade remedies. And if you try any of these Keep Deer Out of Your Garden methods, let us know how you make out in the comments below! Thank you for stopping by.